3. Flavour packed cooked vegetables with dal and rice. Feeding a 7 month old baby is not easy. Therefore we have made a list of Healthy, Delicious 7 Months Baby Food Recipes exclusively for you. We understand you must be very tired of trying different tricks to ensure all the essentials reach your baby’s body. But have you tried different 7 months baby food recipes? Yes. Babies need change like all of us. They do not like eating same boring food every day and especially a 7 month baby loves to eat different kinds of food. Click on the share button and drop in your comments and let us know what you feed your 7 month old baby. 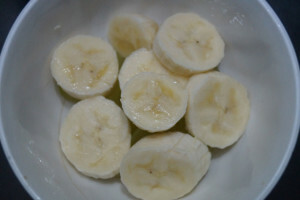 If you have 7 months old baby and you are looking out for 7 months baby food, Check out Mini Banana Idlys. Banana is the best food you can give your 7 month old baby. Its super yummy, effortlessly digestible and easily available. Then why not try Idlys with Bananas? Here is the simple recipe for Mini Banana Idly that you should definitely try at home. 1. 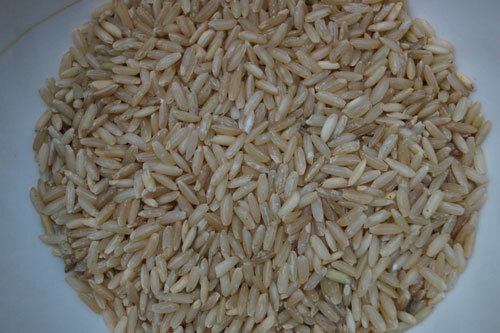 Soak rice and dal separately in water for at least for 3 hours. 2. Drain the water but save it for blending. 3. Blend the urad dal in a wet grinder until smooth and frothy. 4. Pour this batter in a bowl. 5. 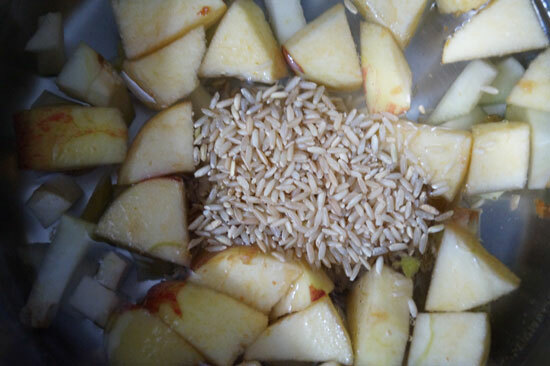 Now blend the rice and poha in the wet grinder. You can add some of the reserved water too. 6. 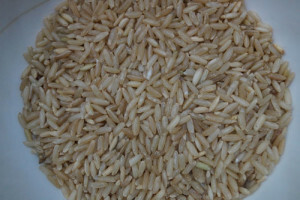 Poha is used to make the idlys soft. 7. Feel the batter with your fingers. It should be a smooth paste and not grainy. 8. Now mix the rice batter with the urad dal batter. 9. Add a pinch of salt and mix well and leave it to rest overnight. 10. Next morning you will see that the batter has risen and doubled up. 11. Add mashed banana and some coconut milk to this batter. 12. Take your mini idly steamer (if you don’t have a mini idly steamer, you can use the regular sized one) and grease the moulds lightly with ghee. 13. 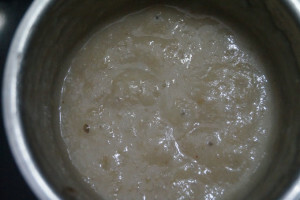 Now pour the banana idly batter in the moulds and allow to steam for about 10-15 minutes. 14. Be careful not to overcook the idly since it may become dry. 15. Allow the soft fluffy idlys to cool and serve them to your little one. 16. This is a very healthy food for your baby. If you have liked this yummy recipe of Mini Banana Idlys, do try at your home and let us know how it turned out for you. Moong dal is immensely healthy, apart from being high in protein it contains magnesium, manganese, folate, zinc, potassium, copper and various B vitamins. 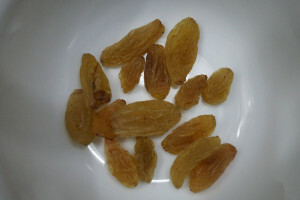 It is also very filling and has high dietary fiber content. 1. Take some moon dal wash it repeatedly with water. 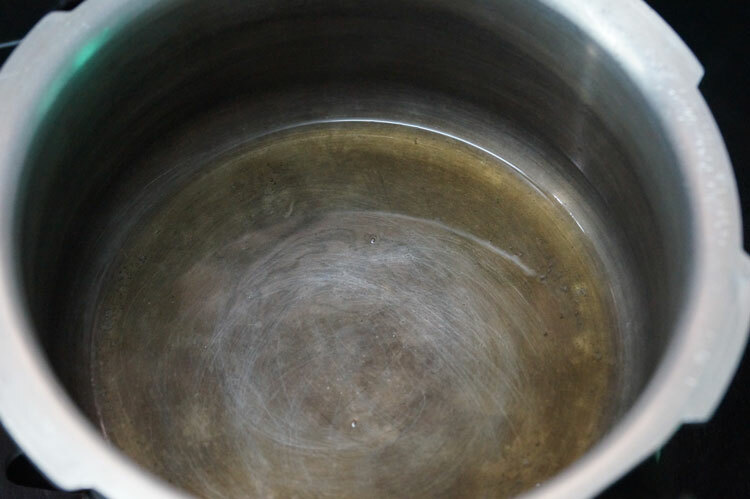 If possible, soak it for at least 20 minutes before starting to cook. 2. Take a cooker and add a few spoons of ghee in it. Add a little cumin to it and let it splutter. 3. Add in washed moong dal and let it fry for two to three minutes. 4. Add in chopped carrot and bottle guard. 5. Add salt as per taste and add some water to it. 6. Pressure cook on medium flame for two to three whistles. 7. Take a masher and mash it thoroughly. 8. For you small baby, it is recommended to cool the soup and blend it to get a smooth puree. 9. Top it up with some more ghee and squeeze in a few drops of lemon. Your delicious and nutritious moong dal soup is ready to be served. Im sure you would be wondering what 7 months baby food are we going to prepare with oats. 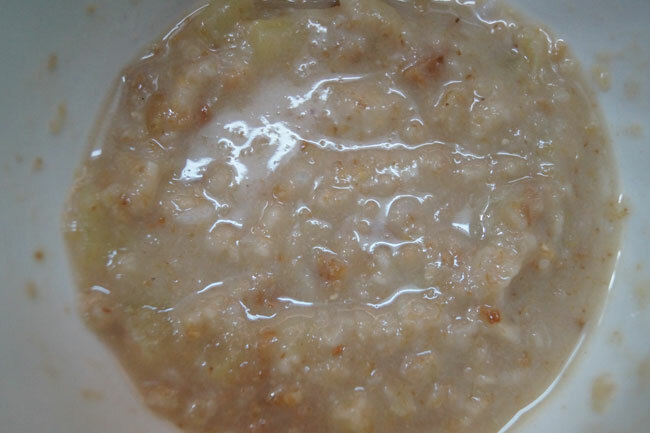 But check out this recipe of Apple and Oats Porridge. You will be surprised to find out how tasty oats can be. 1. 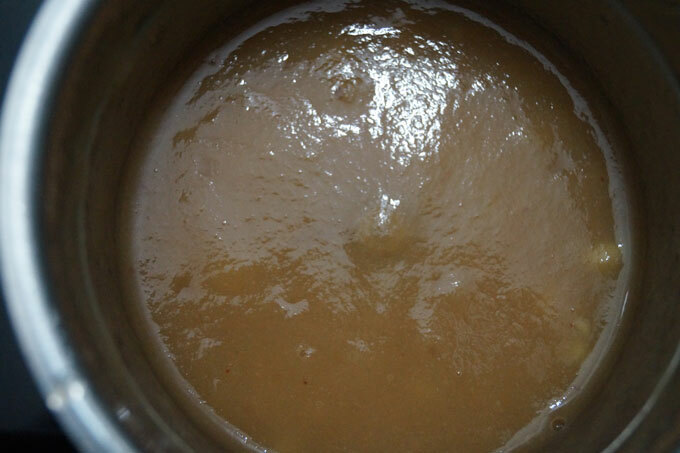 Take a pressure cooker and heat ghee. 2. Add the oats and sauté for 2-3 minutes on a medium flame (Do not use a high flame). 3. 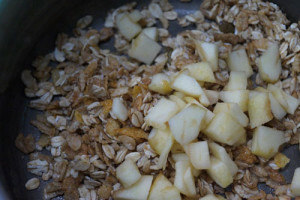 Dice the apple and add it to the oats. 4. Add formula and water or milk and water and cook for 2 whistles. 5. 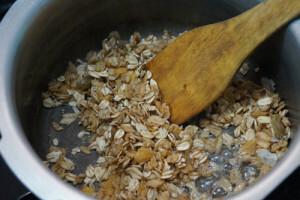 You can alternatively boil it on the stove until the apple and oats become soft. 6. Once done, mix well to form a creamy porridge texture and feed it to your baby. Feed this yummy recipe to your bundle of joy. It is healthy and tasty too. Drop in your comments and let us know if our recipe had worked out for your baby. 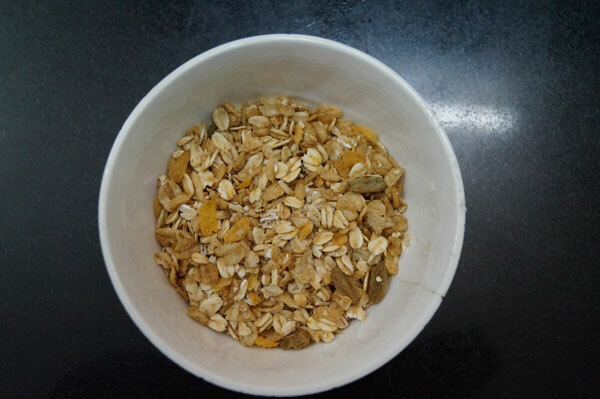 Share the article if your little on relished having this super food. 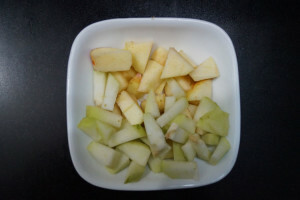 Apple, Pear and raisins are three amazing fruits with which you can try a lot of dishes. For 7 months baby food we have tried this dish called Pear, Raisin and Apple Brown Rice. 1. Cook all the ingredients together in water until soft. 2. 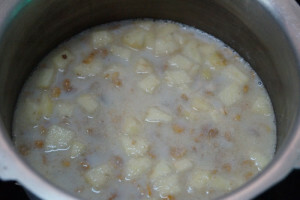 Once the apple, pear, raisins and rice are cooked, blend them to a smooth consistency in a blender. 3. You can alternatively just mash it until soft since at this age, you baby will start enjoying new textures. 4. 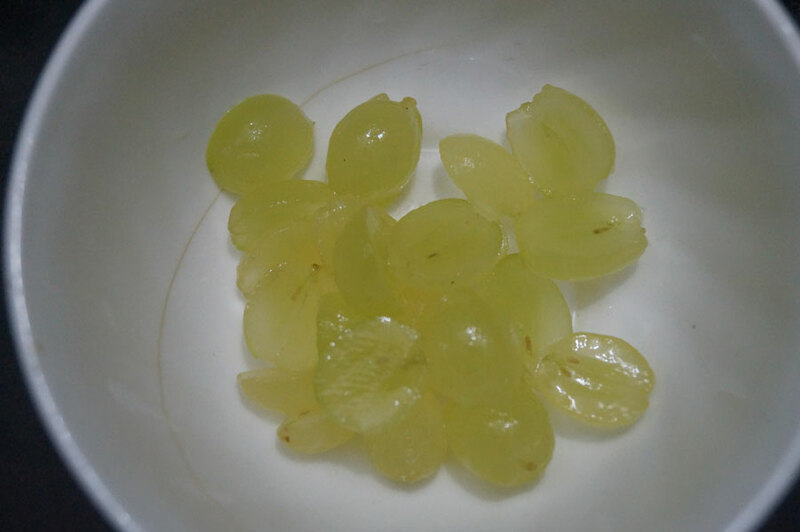 This is a naturally sweet food because of the fruits and raisins. Your baby will love this new flavour. If you have a similar recipe, drop in your comments and we shall get in touch with you. Let all the moms out there take advantage of your knowledge. Like earlier said, every mom loves vegetables and feels much better if her little one eats them without weaning. Try this 7 months baby food called Flavour Packed cooked vegetables with dal and rice. 1. 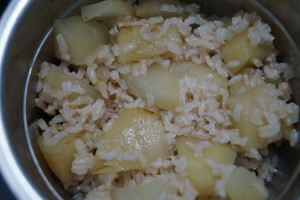 Cook rice separately until soft. 2. Now take a pressure cooker, add ghee and heat. 3. Add the diced onion and sauté. Add cumin powder to this and cook until the onion is soft and translucent. 4. Now add tomato and carrot and mix. Add dal to this and pour water and let it cook for 1 whistle. 5. Once cooled, mash this mixture until smooth. 6. Add the cooked rice and pressure cook for 1 more whistle. 7. Once done, add tempered curry leaves and mix well. (If you wish, you can omit this step). 8. Remove the curry leaves before serving. Note: You can use any vegetable along with carrot (potato, peas etc). Flavour packed cooked vegetables with Dal and Rice is ready to be served. Root vegetables are an ideal way to introduce your baby to vegetables since they are naturally sweet and perfect for purees. They are also a good source of Vitamin A which is vital for healthy skin, hair and the development of good eyesight in your baby. 1. Make sure the vegetables are peeled and chopped properly. 2. Put all these chopped vegetables in a steamer that is set over boiling water. 3. If you don’t have a steamer, pour some water in a big deep dish. Put the chopped vegetables in a smaller dish that fits in the deep dish. Make sure that the water level in the deep dish is lower that the brim of the smaller dish. Cover the big dish and put it on a medium flame. This acts like a steamer. 4. Allow the vegetables to steam for about 20-25 minutes until tender and soft. 5. Once they are cooked, blend the soft vegetables in a blender using some of the water from your steamer. 6. Blend to a smooth consistency. 7. 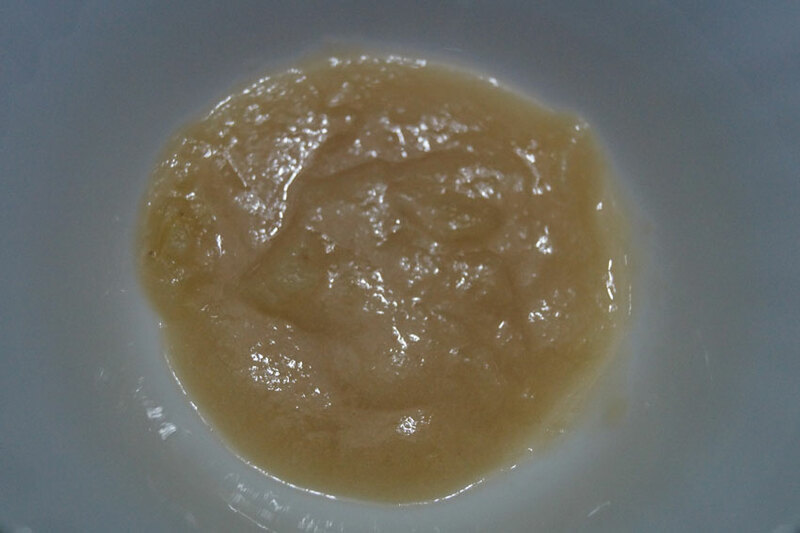 You can sieve this puree and serve it to your baby. Mango is an amazing fruit every baby would love to eat. Make it more exciting by following few simple steps. Try this yummy 7 months baby food called Mango Rice Pudding and see your baby enjoying food. 1. Take a sauce pan and boil the milk. 2. If using baby formula with water, boil the water and add baby formula and stir. 3. Wash and clean the rice well and once the milk comes to a boil, add it to the boiling milk or baby formula and water. 4. Chop the mango and add it to this. 5. Allow this to cook for 30-40 minutes until the rice is soft and completely mixed in the milk (or formula). 6. You will also notice that the milk has thickened. 7. Once cooled, feed this yummy mango rice pudding to your baby. Note: You can substitute Mango with your baby’s favourite fruit (Banana, strawberry etc). Mango Rice Pudding is ready to be served. 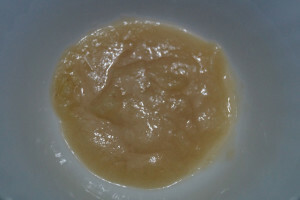 If you have 7 months old baby and you are looking out for 7 months baby food, Check out this tasty Stewed Fruit Puree Recipe. Fruits are one of the best things you can give your 7 month old baby. Its super yummy, effortlessly digestible and easily available. 1. 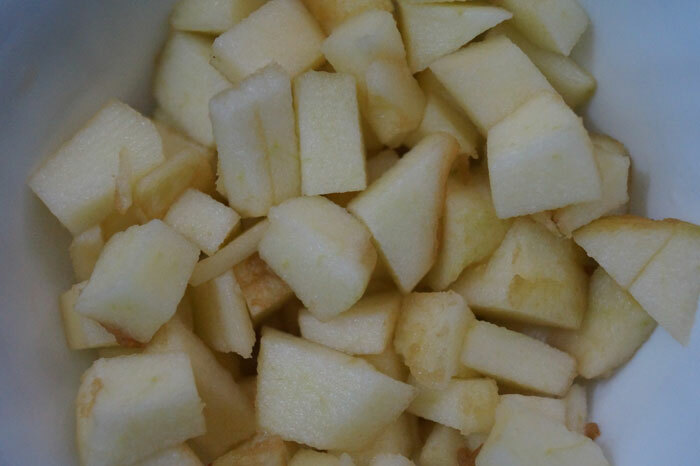 Dice apple and pear and blend the pieces to make Apple-Pear juice. 2. Take a sauce pan and pour this juice in it. 3. 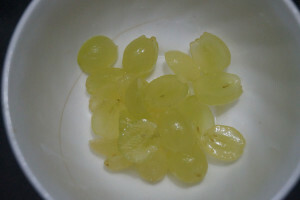 Peel and halve the grapes. 4. Chop the banana and add all the pieces of the banana and grapes to this Apple-Pear juice. 5. 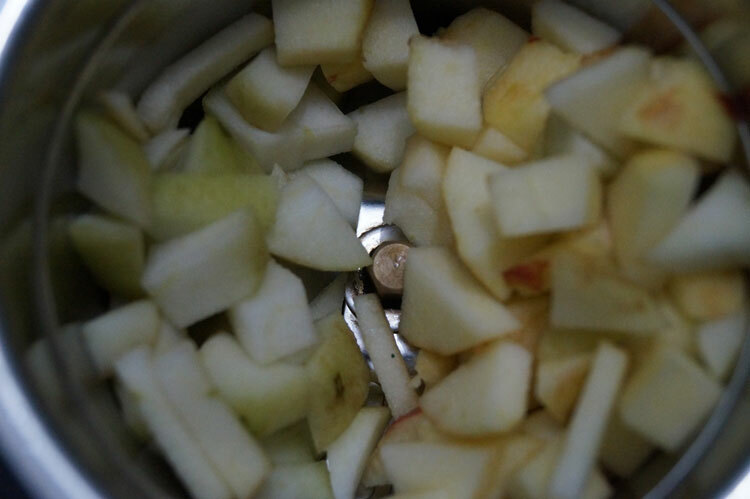 Put the lid over the saucepan and allow the fruits to stew. 6. Once all the fruits are soft, use a blender and blend to a smooth and thick consistency (like the consistency of a jam). 7. This yummy stewed fruit puree is ready for your little one to eat. 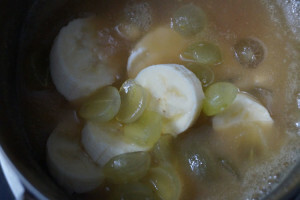 If you have liked this recipe of Stewed Fruit Puree, do try at your home and let us know how it turned out for you. Did you know? Avocado is not a vegetable. It is a fruit. Avocado doesn’t have to be cooked. It forms a great first food for babies because of it’s nutritional value. 3. Scoop out the flesh/pulp. 4. 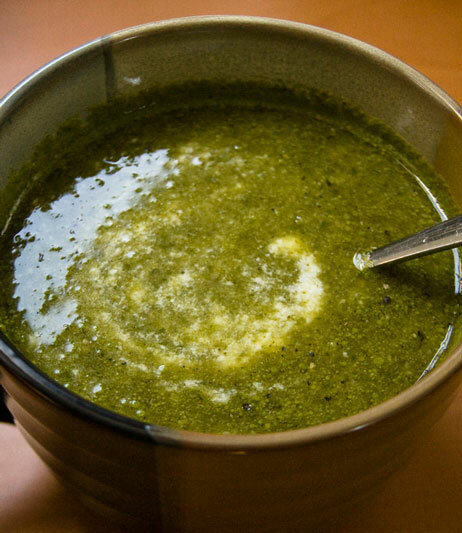 Mash it with a little formula or breast milk or little water and feed it to your baby.